Update: Lenovo is clarifying its position on the sale of small-screen Windows tablets. "We will continue to bring new Windows devices to market across different screen sizes, including a new 8-inch tablet and 10-inch tablet coming this holiday," a statement on its site read. 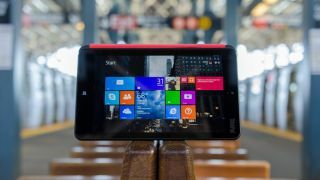 The company noted it is no longer selling the ThinkPad 8 in the US but that it has sold out of the Miix 8-inch. Furthermore, it boldly claimed "we are not getting out of the small-screen Windows tablet business" as has been reported. "In short, we will continue to sell both 8- and 10-inch Windows tablets in both the US and non-US markets," the statement concluded. Lenovo is reportedly killing off its dreams of owning the small screen Windows 8.1 tablet scene. PC World first caught wind of the news and Raymond Gorman, a Lenovo spokesperson, explained the Chinese electronics firm was turning its back on small Windows tablets after tepid sales of the ThinkPad 8 and Miix 2. Now Lenovo is moving to end sales of both 8-inch models while the company moves its remaining stock of ThinkPad 8 tablets to developing countries. Supposedly the tablet will be available to other markets including Brazil, China and Japan. Since mid-June, the ThinkPad 8 has been sold out on Lenovo's site; we've contacted the company to find out how new the decision to step away from small screen devices really is, and will update this story as soon as we hear back. In our own review, we found the ThinkPad 8 to be an amazing 1080p, 8-inch Windows tablet that was fraught with issues, making it too unstable to use leisurely or productively. The Miix 2, meanwhile, was almost the same story with a decent screen but lacking in many other regards, including processing power, storage and a wasted Windows 8.1 experience. Ultimately it seems the problem with these smaller tablets is that they're too compact to make for a productive work environment. Meanwhile, smaller Windows 8.1 tabs demand too much storage space and energy to run to work well in their frames. Adding in competition from the iPad mini 2, Kindle HDX 7-inch, Nexus 7, Samsung tablets and so forth, Windows can't seem to compete with Android and iOS for users wanting an entertainment device. It's for these reasons we can imagine why Microsoft may have decided to cancel the announcement of the Surface Mini at the last minute. At the same time it seems the flood of small Windows devices Microsoft hoped to push along with free copies of Windows 8.1 won't be happening after all, at least not in the way the company envisioned. Although Lenovo is leaving small-screen windows tablets behind it still has plans to produce and sell 10-inch devices: "In North America, we're seeing stronger interest in the larger screen sizes for Windows tablets and are pleased with initial customer demand for the ThinkPad 10," Gorman said. Lenovo also plans to continue to sell the 10.1-inch version of the Miix 2. We're also happy to say the Lenovo 10 won top marks in our latest review as one of the most versatile business tablets around.